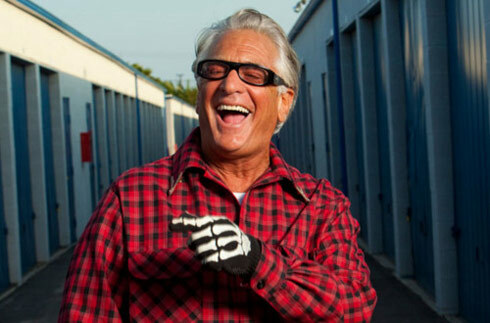 For those of you who have never heard of Barry Weiss, he is known as “The Collector” on American Reality TV show Storage Wars. The premise is simple; TV cameras follow a group of people who make a living selling second hand goods that they buy in abandoned Storage lockers. It is a bit of a lottery. The contents of the lockers are sold by an auctioneer and bids are made after a 5 minute inspection from the door of the locker. No one is permitted to enter the locker before bidding starts. Bidders must use their judgement based on years of experience to evaluate the worth of the contents and take calculated risks about how much they are willing to pay. Some of the things they find are extraordinary but most commonly it is household furniture and bric-a-brac. It is an extremely addictive show. The main buyers featured do a show and tell for the viewers as they investigate the contents of the lockers they have purchased and evaluate how much they will make when they sell the goodies they have uncovered. Occasionally they will consult a specialist to authenticate an item or tell them it’s worth to a collector. Barry is in a class of his own. Unlike the other buyers the eccentric millionaire is not hoping to make a profit on his purchases but to find any antique items he can add to his personal collection. There is one thing he has in common with the other buyers and that is a range of strategies to distract the other bidders to increase the likelihood of winning the auction. But like Barry himself they are far from conventional. He arrives at each auction in a different vintage vehicle and often brings friends with him such as psychics to help him decide if the locker is for him, he also brought a remote control plane along to one auction with a camera attached to peek inside the locker. His fashion sense is equally unusual; in one episode he donned a disguise and became a hobo for the day. He seems to lose more often than he wins in terms of the value of his purchases but it is all part of his charm. I would love to see this wonderfully weird man host his own reality TV show. Camera men could simply follow him round and record his daily antics. The Barry Weiss show would definitely be worth watching.